Jews have lived in Oklahoma since the mid 19th century. first few years, the congregation met at several local churches. The synagogue, located at 50 Broadway Circle, was dedicated January 17, 1908. Temple B'Nai Israel remained in this building until 1955, when they moved to a new synagogue on North Pennsylvania Street. 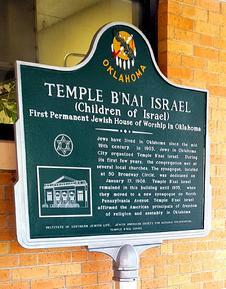 Temple B'Nai Israel affirmed the American principles of freedom of religion and assembly in Oklahoma. 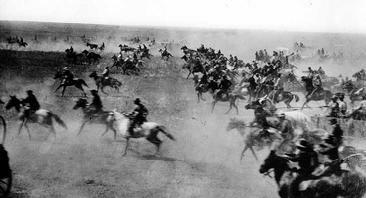 Oklahoma - A Jewish Story For Jews, incredulously to those few fortunate Jews who were in the dangerous, unknown remote across the Hudson River of Oklahoma, America was offering them the opportunity for free land. A few Jews could be identified in the massive run. America was offering them land not on the basis of religion, but on their willingness to reach for the Golden Ring.